I have to admit I know very little about dyscalculia in comparison to say dyslexia, autism and attachment theory. However, one evening this week - whilst casually surfing the net - I stumbled across this 5-minute BBC documentary, originally from The One Show, which provides a good introduction. From there, I've done a bit more focused reading around the subject. Certainly I have encountered students who present with persistent, specific difficulties with acquiring basic numeracy and from there, higher-level Maths skills. But the numbers of those who experience this as their sole difficulty and not alongside other issues such as autism, dyslexia and low self-esteem is, from what I have seen over the past decade, relatively low. Students who present with 'pure dyscalculia' tend to be a 'minority within a minority'. I am ready to accept the argument that this could be an issue of mis-identification - and maybe also due to our national culture where illiteracy is something to be very concerned about whereas innumeracy is something far more acceptable. How many times have you heard, "I'm really worried, he's struggling with Maths..." compared to "I'm really worried, he's struggling with reading and writing..."? And this is perhaps why SEN & support teams have much less referrals relating to particular concerns over numeracy. There are various reasons posited for why people do not, and seemingly cannot, acquire a level of Maths required for everyday living and working. Our national culture has already been mentioned and the quality of Maths teaching has also come under the spotlight but there is evidence to suggest that dyscalculia-type differences are rooted in genetic / biological make-up, sitting quite separately from general intelligence - which often then snowballs into a full-blown difficulty via the education system. A question has also been raised as to whether we are currently caught in a vicious circle whereby parents with underdeveloped Maths do not have the understanding, skills or confidence to help their sons and daughters with Maths homework. - comparing and contrasting using smaller / bigger, taller / shorter etc. > Are they good at speaking and listening, but cannot process or explain a Maths problem in verbal or written format? > Are they reported to be good at working with words and phrases (i.e. higher attainment grades at English, History etc) but struggle to read numbers and Maths symbols? > Are they visually creative (i.e. higher attainment grades at art, graphics etc.) but struggle when working with specific, more complicated measurements? > Do they have a generally good attitude to learning but are often late to lessons / appointments, cannot remember a schedule such as a school timetable and struggle with time management in terms of estimating how long something might take? > Are they sociable and competitive when taking part in sports and word-based board games such as Scrabble etc. but avoid strategy-based games such as chess, Monopoly etc.? >Are they outgoing and independent but tend to get lost easily when in an unfamiliar place, struggling to follow a map or list of directions etc.? If a young person (or adult) presents in this way, the question then is what can be done to formally identify and document their difficulties as a route to accessing further support. I have yet to come across a widely-used, professionally-recognized screener - and much like dyslexia, I think there is a reluctance these days to assign the label formally in any case. Usually the identification process involves running a range of ability and attainment tests that highlight possible discrepancies across their core skills set - and in turn, provide a signpost to the 'dyscalculia' difficulty section of the SEN library. I typically use the WRAT-4 Maths Computation subtest, the NNAT, the BPVS and then compare these with the results of our routine testing of reading, spelling and comprehension. A simple conversation with the student about their school timetable, asking them to traffic-light it, can also prove invaluable in unpicking specific issues. - Place-Value - the use of number-lines within the mind's eye - i.e. 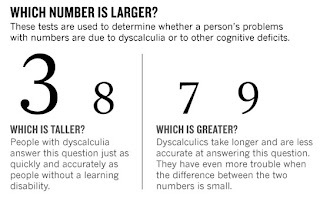 a learner with a dyscalculia-type difficulty tends to not be able to spatially represent the distance between two numbers, such as 200 to 800 and from there find a number in-between. - Visual-Estimation - the method, and subsequent accuracy and speed, with which a person can count - i.e. a learner with a dyscalculia-type difficulty tends to count a collection of dots one by one whereas a more neurotypical learner will count them in chunks of 3 to 5 at a time. - General Arithmetic - the learner's general arithmetic skills are assessed with reference then made to their history of numeracy / Maths acquisition in comparison to other subject and skill areas. But even through use of this kind of screening process, it is likely to lead to an assessor committing only to a 'dyscalculia-type difficulties' commentary. This is not necessarily a problem because ultimately what any assessment for specific learning difficulties / differences should be seeking first and foremost, rather than a diagnostic label, is a way forward. Within my own setting, where we have identified students to be presenting with dyscalculia-type difficulties, whilst we insist on not branding them as 'dyscalculic', we do use the information we have to advise our Maths teachers - and the general population of teachers - of their learner profile. A collection of the kind of advice strategies we draw upon can be found here on TES Resources. 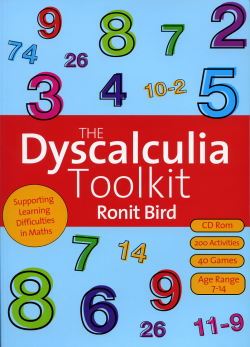 From there, where necessary, our Learning Support Team provides extra tuition, tending to rely on Ronit Bird's 'Dyscalculia Toolkit' which coaches students in numeracy skills via a multi-sensory approach similar to that which underpins specialist dyslexia programmes. We have also dipped into books such as Edward H. Julius's 'Rapid Maths Tricks' which outlines alternative ways around common Maths problems. Over the coming weeks I intend to read around more on dyscalculia with a view to seeing if there is more we can look to do for the 'minority of the minority' within my current setting. I'll share any other ideas I come across - and welcome any suggestions from readers, either publicly via the comments section or privately via the contact page.